These Umbrella Plants are really beautiful and attractive as the involucral bracts are symmetrically arranged in an umbrella formation and held atop elegant stems that sway with the breeze, giving a tropical touch to the landscape! We’re smittened by their beauty! Our fascination with this plant started as early as late 2003 and have since propagated them repeatedly, using plants from one single pot purchased then! Isn’t that marvelous – such a hardy and generous perennial that is so simple and easy to propagate, to grow and seemingly free for life! Another great attraction is that it’s impossible to overwater as it enjoys damp and boggy conditions, so most ideal for beginners or even seasoned gardeners who enjoy water gardens! This lovely and versatile plant can be easily grown, both in shallow water of small fish ponds and pools as an aquatic plant, or around them in the ground as a waterside/bog plant. 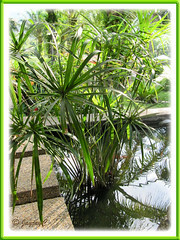 It’s ideal too as an accent plant or a background plant in gardens, grounded or in containers. Origin: Native to Madagascar in Africa, but naturalized in other parts of the world through cultivation. Plant type: Perennial grass-like herbs, cultivated for its ornamental beauty. Features: Cyperus involucratus is one of the approximately 600 species of the genus Cyperus, a group of annual and perennial grass-like herbs widely spread throughout the world except for very cold regions. 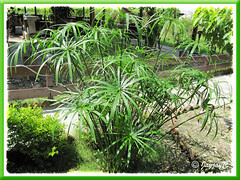 A herbaceous and evergreen tropical perennial, it is a vigorous-grower with a clump-forming habit, producing dense clusters of slender trigonous stems that emerges from a network of woody rhizomes and grow to varying heights of up to 1.8 m.
The dark-green-coloured stems are without leaf blades apart from the inconspicuous brown leaf sheaths that wrap the bases. Their ornamental beauty lies above where each graceful and erect stem is tipped with a whorl of about 2 dozen dark-green, narrow and grass-like bracts with mildly-toothed margins, measuring up to 30 cm or more in length, 1.3 cm in width and spreading like spokes of an umbrella or wheel. Aptly named, the Umbrella Plant is truly elegant-looking and fascinating, excellent for any landscape or water gardens as it’s naturally happy in damp conditions. In summer, it bears about 15-25 stalked clusters of insignificant greenish flowers from a central spikelet that grows atop the green disk, and develop into brown fruits when matured. It can grow vigorously under good conditions, forming dense colonies which resulted it being identified as weedy or invasive in Australia and the United States. Nevertheless, it can be contained if planted in tubs or containers. Culture (Care): Cyperus involucratus, a hardy and robust bog plant that is so easy to grow, needing the least maintenance. Light: Grows best in bright light indoors or filtered sunlight outdoors, thriving well in moderate to warm conditions. It can tolerate some direct sunshine, light shade or even poor light for short periods, not too long though, as full sun may bleach its grass-like bracts and poor light may retard its growth and result in lesser stems. Moisture: It requires lots of water and you can never overwater it. It enjoys growing in shallow water but if grounded in soil or in containers, keep soil constantly moist and avoid drying of the soil which may result in the ‘umbrellas” turning yellow and wither or the browning of leaf tips and margins. Likewise too if air is dry, so increase humidity when necessary. Soil: Preferably loamy medium with water-holding capacity but can be adaptable to regular potting soil or a wide variety of soil types. Others: It enjoys very humid conditions. 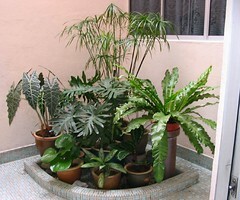 So mist the plants regularly or stand them in shallow trays of water to maintain its evergreen beauty. Feed once fortnightly with a general liquid houseplant fertilizer during active growth. On the whole, it needs very little care apart from discarding old stems that have turned yellow or repotting when the plants become pot-bound. 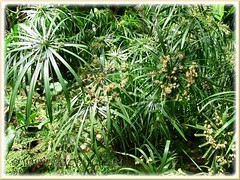 Cyperus involucratus are generally free from pests, but do check occasionally for mealy bugs. For subtropical regions: Hardiness: USDA Zone 8-11. A tender perennial that does not tolerate freeze. It’s known to die back to the ground in frosty regions (Zones 8 and 9) but do come back strong after a frost or freeze. Umbrella Plants/Sedges enjoys moderate to warm conditions and high humidity too, so increase humidity especially in hot summer or in artificially heated homes in winter. Propagate by clump division or seeds sown in spring or early autumn. Fertilize sparingly in winter, once or twice is more than sufficient. Propagation: By division of clumps or seeds sown in normal potting medium. It self-sows readily too. Can be propagated from tip cuttings of stems that are placed upside down into warm moist medium and watered regularly. Alternatively, bend down the tip end of a stem with the leaf bracts onto very moist soil, pin down and eventually a new plant will begin to grow within a few weeks. 1. Cut off the tip of a stem. 2. Invert it with its head plunge into a bottle or jar of water. Site it in a sunny spot and roots will form at the center of the ‘umbrella’ and eventually a young plant will emerge and grow upward in less than a month’s time. 3. Then, carefully detach it as the parent stem rots away, pot it and place in a bright place for the young plant to establish. 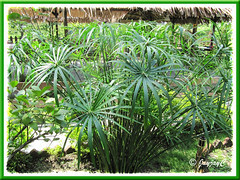 Usage: An excellent ornamental waterside or marginal plant for water gardens. 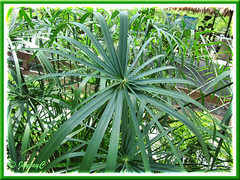 Indoors, Umbrella Plants are useful as a houseplant for homes and conservatory, or as interiorscape plant for commercial offices, hotels and malls, ideally in containers stood in water. 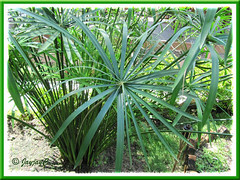 Its fascinating shape makes it a great plant for landscapping, and as an accent plant or informal screen. As a backdrop plant, it combines well with other foliage plants or flowering plants in garden beds or borders for added interest and height. Can be used in fresh or dried floral arrangements. Never knew that you can actually put the florette into the water and they sprout! Wonder if this works for the rest of the cyperus genes. 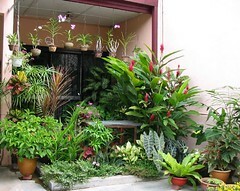 I really enjoy your grand entrance plant arrangement – they are so neat, tidy & clean. Thanks, lovely to know that you liked our frontyard garden display…this was in 2004, during the earlier gardening years. Though it has evolved over the years with some changes, the style hasn’t change much due to space constrain. Jacqueline, this method of ‘under-water’ propagation is really interesting. Very smart of you ! Thanks for dropping by, Autumn Belle! Have a lovely day and a great weekend! 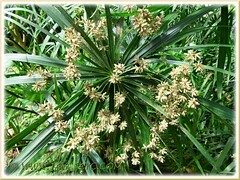 more information about cyperaceae and its members? Thank you for this post. I have been tempted to plant the Cyperus alongside my larger pond. I already have the King Tut planted by our waterfall. Too bad that both plants are annuals where I live (Manitoba, Canada). However, this does not deter me from planting them each year! Sorry, Riffat…please google for such info elsewhere! Very interesting article. I live in Jamaica. Can you believe that i went to one of our local picnic parks. It has a river. and saw the plant all over the side of the river. I took a piece and was told that its a weed! 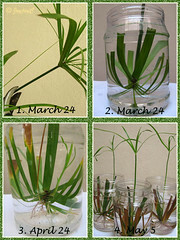 I am trying to grow it and one stalk is ok while the others are withered and going brown. What do i do? Will they come back or do i need to cut them off? Oh, its on my patio and gets morning sun. I believe that once the stem withers and turns brown, it is irreversible and should be trimmed and removed. Great posting. Trying my first Baby Tut next to my waterfall in a boggy area. Thank you for your generous comment, Jay Slater!